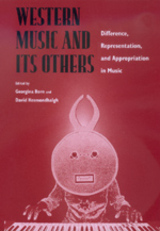 The essays scrutinize a diverse body of music and discuss a range of significant examples, among them musical modernism's idealizing or ambivalent relations with popular, ethnic, and non-Western music; exoticism and orientalism in the experimental music tradition; the representation of others in Hollywood film music; music's role in the formation and contestation of collective identities, with reference to Jewish and Turkish popular music; and issues of representation and difference in jazz, world music, hip hop, and electronic dance music. Written by leading scholars from disciplines including historical musicology, sociology, ethnomusicology, anthropology, popular music studies, and film studies, the essays provide unprecedented insights into how cultural identities and differences are constructed in music. Georgina Born lectures on the sociology of culture at the University of Cambridge and is a Fellow of Emmanuel College in Cambridge. She is the author of Rationalizing Culture: IRCAM, Boulez, and the Institutionalization of the Musical Avant-Garde (California, 1995). David Hesmondhalgh is Research Fellow in Sociology at the Open University. "The great value of this collection lies in the wealth of questions that it raises--questions that together crystallize the recent concerns of musicology with force and clarity. But it also lies in the authors' resistance to the easy 'postmodernist' answers that threaten to turn new musicology prematurely grey. The editors' comprehensive, intellectually adventurous introduction exemplifies the sort of eager yet properly skeptical receptivity to scholarly innovation that fosters lasting disciplinary reform. It alone is worth the price of the book." —Richard Taruskin, author of Stravinsky and the Russian Traditions: A Biography of the Works Through " Mavra"
2. Race, Orientalism, and Distinction in the Wake of the "Yellow Peril"
6. Composing the Cantorate: Westernizing Europe's Other Within (Philip V.